ISRO’s received accolades from all over for its record-breaking 104 satellite launch yesterday. The achievement has been hailed by the government leaders, scientists, and the world media. But ISRO received a very special nod of appreciation today morning. Elon Musk weighed in on the ISRO launch, calling it an awesome achievement. “Very impressive,” he tweeted. @Floydilicious Yeah, awesome achievement by ISRO. Very impressive! Now Musk is hardly a casual observer in the satellite business – he directly competes with ISRO in the launching satellites. His own company, SpaceX, has been sending rockets to space for years, and is working on making them reusable. SpaceX, though, has had a difficult time with satellite launches in the recent past. In September last year, SpaceX’s Falcon 9 rocket had exploded at the launch pad, and had blown up the satellite it was carrying. The satellite had belonged to an Israeli company called Amos, and was to be used be Facebook for bringing internet to developing areas through its Internet.org initiative. The destroyed satellite had meant that Facebook’s Internet.org program had received a setback, and had left CEO Mark Zuckerberg “deeply disappointed.” There had been a significant monetary loss too – the satellite was worth $200 million (Rs. 1,200 crore) before it went up in smoke. ISRO, for its part, managed to send up 104 satellites into space yesterday without incident. The cache of satellites included several belonging to private companies, of which 96 belonged to the US. ISRO also provides its services for far cheaper than SpaceX, with reports saying that its prices are a third of the US-based startup. And Musk congratulating ISRO on its launch is significant – he isn’t always charitable to companies that compete with his own. 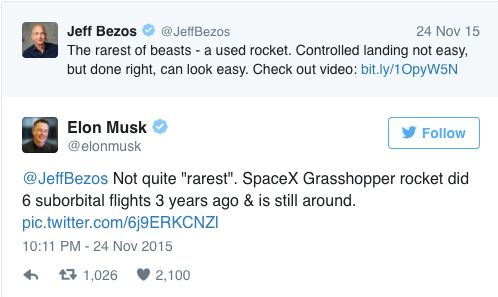 In late 2015, when Jeff Bezos’ Blue Origin had called its own launch the “rarest of beasts”, Musk had immediately hit back, saying it wasn’t quite the rarest, and SpaceX had been there, done that. Coming from Musk, the “awesome achievement” for ISRO’s launch is high praise – and he likely means it.